Our next full time Transpersonal Arts and Therapy/Health and Wellbeing trainings will begin on 23 September 2019. The training runs for 3 years. Students are required to attend Tobias two days a week (Monday and Tuesday 09h30-17h00) term time, for the first two years. Clinical placement will begin in the second year and intensifies in the third year. Our graduates work in the private and public sector as therapeutic arts practitioners/arts counsellors. We train our students to work in a variety of settings, for example schools, hospitals, homes for the elderly, prisons, with refugees, people suffering from trauma, anxiety and depression and more. 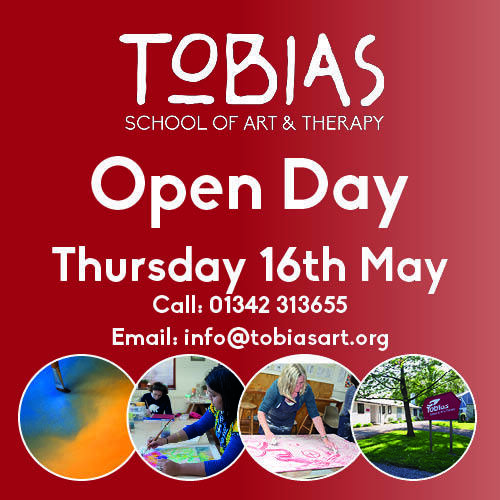 Contact us at info@tobiasart.org if you have any initial questions. Ensure you have had a good look at the entry requirements for the Health and Wellbeing and the Arts in Therapy trainings and have downloaded our prospectus. For students with disabilities, please read our policy . If possible, book to come on our Open Day which takes place on Thurs 16th May. This day is specifically designed so that you gain a greater understanding of the training and what make the learning at Tobias so unique. There will be opportunities to meet current students, share lunch and create artwork. If it is not possible to attend the Open Day, please contact the office to make an alternative arrangement. This can be a visit on another day or even a Skype/Video call appointment. If you think that studying at Tobias will be right for you, complete the application form and submit it by the 30 June 2019. Once the application is received you will be invited to Tobias for an interview. Again if you cannot visit in person, alternative arrangements can be easily made. Once your application is successful we will start processing your paperwork in preparation for your start on 23 September 2019.